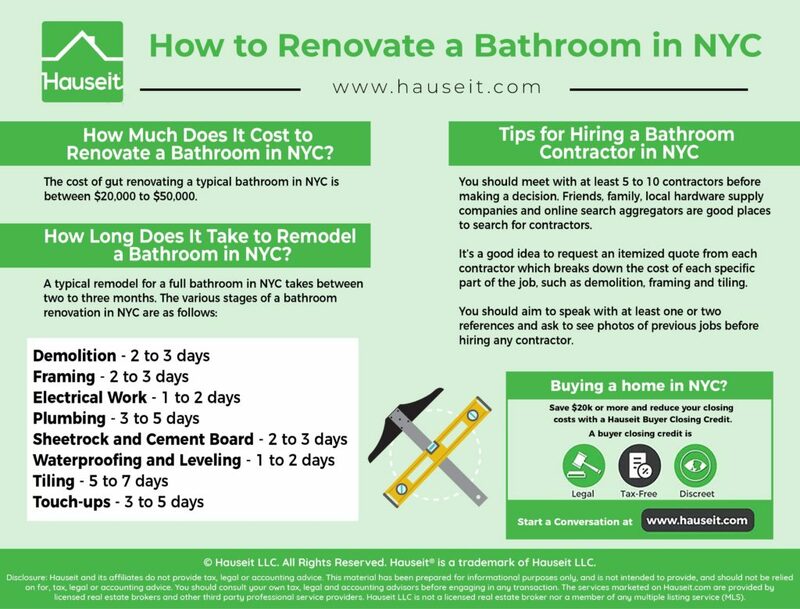 The cost of gut renovating a typical bathroom in NYC is between $20,000 to $50,000. A bathroom gut renovation is a stressful and time-consuming project. To make matters worse, there isn’t always a correlation between how much you pay a contractor and the quality of the renovation work being done. Due to the sheer amount of misinformation and sketchiness in the construction industry, it’s very easy to get ripped off when renovating an apartment in NYC. 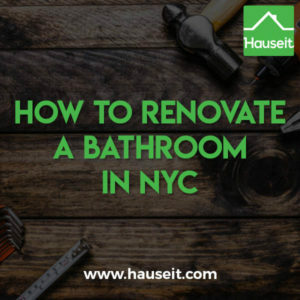 Fortunately, you can save a tremendous amount of time, money and possibly avert a disastrous outcome simply by learning the step-by-step process for renovating a bathroom. Having knowledge of exactly how renovation work is done and how long each phase of the project takes will allow you to make the most educated decision when it comes to hiring a contractor. If you’re buying a co-op and planning on renovating, it’s important to fully understand the cost of renovations and the co-op’s down payment, debt-to-income and post closing liquidity requirements. You can estimate how much co-op you can afford using Hauseit’s Home Affordability Calculator. 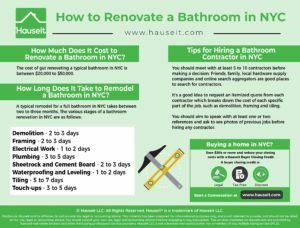 How Long Does It Take to Remodel a Bathroom in NYC? What Is the Typical Bathroom Remodel Cost in NYC? A renovation timeline of two to three months is realistic for a typical bathroom of under 100 square feet with average ceiling height. It can take significantly longer if you’re renovating a larger bathroom (perhaps with a bath and a shower) or renovating a bath in a loft space with high ceilings. You can add weeks to your bathroom remodel timeline in NYC by increasing the scope of work to include things like dropping a ceiling or replacing a window. Similarly, relocating the toilet or shifting the location of plumbing or electrical lines will prolong the renovation timeline. The speed of a bathroom remodel in NYC depends in part on the construction techniques used by your contractor. For example, it takes longer to frame a bathroom using cement board instead of sheetrock. This is because cement board is heavier and more difficult to work with and install compared to typical sheetrock. Pro Tip: The terms sheetrock and drywall are often used interchangeably. ‘Sheetrock’ is actually just a specific brand of drywall, similar to how a BAND-AID is a specific brand of adhesive bandages. Similarly, WonderBoard and Hardybacker are specific brand names for cement board. Cement board is installed behind tiles and used as a tile backer. It is also used in bath and shower basins due to its greater resilience compared to drywall. Bathroom renovations in walk-up buildings can take significantly longer, and it’s not difficult to understand why. Let’s say you are in a loft building and you plan on tiling floor-to-ceiling with a ceiling height of 12’. For a bathroom with 4 walls of 10’ each, you’d need approximately ~500 sqft of tile which weighs over 500 pounds. Whereas in an elevator building you could simply load all tile onto a hand truck and deliver it in one journey, for a walk-up you’d have to make literally dozens of trips up the stairs using hard labor. Simply delivering this amount of tile for a walk-up could take an entire day. If you were in an elevator building, the delivery would be done in under an hour and your workers could continue doing other projects without wasting a day. The speed of a bathroom renovation largely depends on how many people show up to work on your project each day. A bathroom renovation can also take longer if there are frequent gaps between stages of the project: demolition, framing, electrical work, plumbing, etc. A good contractor will provide you with a timeline and carefully monitor progress in order to minimize the down time between the different crews which will work on each stage of the project. How quickly your bathroom remodel in NYC will take also depends on your choice of materials. For example, using 3” x 6” Subway tile or mosaic tile on the walls will take significantly longer to install compared to using 12” x 24” pieces of tile. Similarly, using a wall-mounted vanity will take longer to install than a floor-mounted vanity since your contractor will have to spend half a day reinforcing the wall it mounts to using 2-by-4s and plywood. Your building’s renovation rules can also impact the speed of your bathroom renovation. Most co-op alteration agreements (also known as renovation rules) prohibit you from working on weekends, holidays and outside of 9am to 5pm on weekdays. At the same time, most buildings will also prohibit you from doing construction for longer than four to six months. Ultimately, your bathroom renovation will take longer if you receive lots of complaints from management and neighbors. Who you choose as your contract has a large impact on the amount of noise complaints you receive from neighbors. This is because some workers are louder than others. For example, a worker who is in a rush may choose to use a noisy grinder for a small cut which would easily be done with a manual saw. A typical bathroom remodel in NYC costs between $20,000 to $50,000. Most contractors in NYC will provide you with a labor-only quote of $15k to $25k excluding plumbing and electrical work. This includes demolition, framing, building the shower area, tiling, painting and touch ups. Once you add the cost of an electrician and a plumber, the labor costs of a bathroom renovation can end up being $20k to $30k or more. Additional work such as building shelves or framing a window can quickly increase your labor costs. As far as materials are concerned, there is a huge variation in potential cost depending on the quality of your tile and finishings. For example, you can buy a $200 toilet or a $1,200 toilet. You can buy marble tile for $50 per square foot or cheap porcelain tile for $4 per square foot. A Duravit vanity can run you up to $2,000 while a generic, no-frills sink vanity at Home Depot may cost under $400. You can buy a $1,000 backlit vanity mirror or you can find a free mirror on the street. Here’s another example: using soundproof drywall (often called QuietRock) around your laundry room can cost three times more than standard drywall. The same goes for molding: using real wood molding will cost you multiples more than buying medium-density fibreboard (MDF) wood. Finally, purchasing a solid wood door will cost at least twice as much as a hollow door. The easiest way to find a bathroom contractor in NYC is to reach out to your immediate network of friends and family. The most important thing to do when hiring a contractor is to check references, so asking people you know is the most natural way to find a trustworthy contractor. If you don’t know anyone who has done a bathroom renovation, another good place to look for names is at your local hardware supply store. These are the places where contractors go to pick-up supplies for jobs. As a result, the people working here can often provide recommendations. Another way to find a bathroom contractor is to use an aggregator site like HomeAdvisor or a review-based platform such as Yelp or Google. As a general rule of thumb, you should meet with at least 5 to 10 contractors before making a decision. Take copious notes on each meeting, and try to ask each successive contractor about the various things which previous contractors may have told you. It’s very common for contractors to have different opinions on virtually everything. It’s a good idea to request an itemized quote from each contractor which breaks down the cost of each specific part of the job: demolition and trash removal, framing, tiling, etc. Once you receive a bunch of itemized quotes, you should compare each specific line item. Once you’ve narrowed down your list of candidates, the next step is to ask for references and photos of previous jobs. It’s truly shocking how many successful home owners in NYC don’t bother to call any contractor references before agreeing to a $30,000 job! No matter how impressed you were by a contractor’s sales pitch, you must absolutely speak with references before hiring that contractor. Once you have one or two candidates left, you can consider negotiating down the price for specific parts of the quote. It’s also prudent to review the language of the job description in the contract and request additional detail in writing if anything is vague. You should also discuss payment terms, as most contractors will assume you’re paying cash. Telling then you’ll pay with a card or check early on when you hire tiem and then offering them cash once it’s time to pay can save you up to an extra 10%. A bathroom demo for an averaged size bath in NYC takes two to three days. There is a lot of dust and noise involved, especially if the bathroom being demolished has fully-tiled walls, a cast-iron bathtub and/or lots of cement-board backing or poured concrete on the walls or floors. A cast iron bathtub can weigh over 300 pounds, and it’s usually impossible to remove it one piece since there’s not a lot of room or access in the shower body. Be prepared for epic levels of noise, as your contractor or plumber will use a sledgehammer to break it into few pieces before removing it. Demolition also creates a tremendous amount of trash. A typical 100 sqft bathroom demo can create up to 150 large, black bags of trash. The cost of simply disposing of the trash can exceed $1,000. Framing consists of building out any walls in the bathroom (such as for a closet or laundry area) in addition to framing the shower body. Framing typically takes two to three days. Because framing is one of the most structurally important parts of a bathroom renovation, it’s important for you to physically monitor the construction work if possible. Specifically, you should frequently use a level to check whether or not everything is properly level. It’s also a good idea to check how rigid the frame is and ask the workers to use additional support brackets if you feel any movement of the frame. If the contractor is reinforcing the subfloor, you should make sure they take ample time to support it with 2x4s and plywood wherever necessary. The best way to reinforce the subfloor is to add 2x4s for support, replace the first layer of plywood and add a second layer of plywood thereafter. Later on, the contractor can add a layer of cement board and use self-leveling cement on top to create a level and impenetrable surface on which you can install tile. 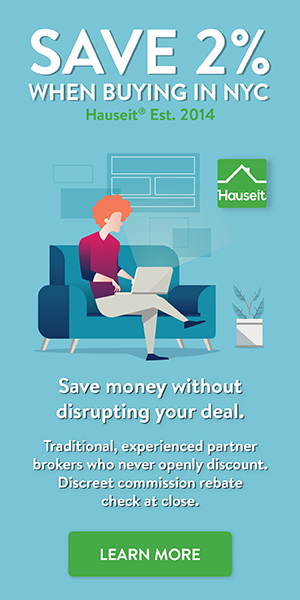 Pro Tip: Estimate your seller closing costs in NYC with Hauseit’s interactive closing cost calculator for sellers.Estimate your seller closing costs in NYC with Hauseit’s interactive closing cost calculator for sellers. Redoing the electrical in a typical NYC bathroom takes just a day or two. The cost of replacing outlets, a GFCI upgrade and bringing in new lines for a washer/dryer connection is usually no more than $2,000. If the electrical lines are already in place and you’re simply adding or shifting a few outlets, the cost will only be a few hundred dollars. Updating switches is also a fairly minor job. Redoing the plumbing in a bathroom typically takes three to five days. The scope of work and cost will vary dramatically depending whether or not you’re moving the location of any fixtures. When interviewing plumbers, it’s important to ask for the exact scope of work they’re offering as part of the quote to avoid any surprises. Here’s an example: Some plumbers will say the job includes removing the existing bathtub and installing a new bathtub. Sounds good right? Low and behold they will and charge you extra to physically dispose of the old tub! Expect to pay more for plumbing if you’re installing a double-sink vanity, installing both a shower head and hand shower, and/or relocating/extending drain and water lines in the bathroom. Once framing done, the next step is to install sheetrock and/or cement board against the frame. Contractors typically use green sheetrock or cement board in the shower body, as these are more resilient to water compared to traditional sheetrock. The highest quality contractors will only use cement board in the shower body. For areas which are not directly in contact water, sheetrock typically does the job. However, you can make your bathroom more resilient to water by using cement board everywhere if you choose. Keep in mind that cement board is more expensive to both buy and install. Once the sheetrock and cement board is installed, the contractor should install mesh where each piece connects. Thereafter, thinset is usually applied over the mesh in order to create a seal between the connecting pieces. When interviewing contractors, it’s a good idea to ask them how they typically waterproof the shower body and which materials they customarily use. Asking specifics about their construction methods will give you a good indication of whether or not the contractor will deliver high quality work. Once framing and sheetrock is done, the next step is to waterproof the floors and walls and level the bathroom floor. The easiest way to waterproof the shower body is to apply a waterproofing membrane such as RedGard. This is applied with a roller in the same way traditional paint is applied. If your subfloor is not level, your contractor may apply a layer of self-leveling concrete. Once this dries, the floor can be also be waterproofed prior to tiling. Tiling for a typical bathroom takes approximately one week. It can take significantly longer if you’re using small tiles, you have high ceilings or the installation pattern is complex. Tile is typically applied by applying a layer of Thin-set mortar on top of the cement board, on which you install the tiles. Grouting the tile usually takes no more than a day, after which you should seal the grout. If you’re using a natural material such as marble, it’s also important to seal the tile itself. Once all the heavy lifting is done, your contractor will usually need a week to take care of minor touch-ups. These include: painting, grouting touch-ups, and installing the bath vanity, ceiling fan, molding and/or the door and lock. Your plumber will also need to return after the tiling is done in order to add the shower finishings: the shower head, hand shower, shower levers, etc.